Traditional death ballads aren’t a dime a dozen on the modern papcharts, but they’re a recognizable form among the folkways. Most deal frankly with unrequited and/or unequal love and its aftereffects, with gruesome detail and haunted characters; most go so far as to show the callousness of humankind through ghosts and body parts transformed, though history suggests that such lascivious imagery was more commonplace in the Puritan and previous worlds, where the funerial was a family affair, life lessons were taught and learned through song, pining could kill, and death in its stark bodily form was an everpresent part of life. The Ballad of Barbara Allen – also known by several similar names, and recorded canonically as Child Ballad 84, of Northern English or Scottish origin – isn’t a murder ballad, specifically; it is instead a warning tale of despair and rue, with a simple yet beautiful melody and virtually infinite variation in its lyrics. As such, the song makes for both a particularly beautiful example of and a potent template for the larger form. The story is simply told: two would-be lovers die in sequence – first he, of her spurned love; then she, of a belated grief at her cruelty in his passing – thus reinforcing the lesson that acknowledging the heart’s need, and being kind in its honest expression, are fundamental to life itself. 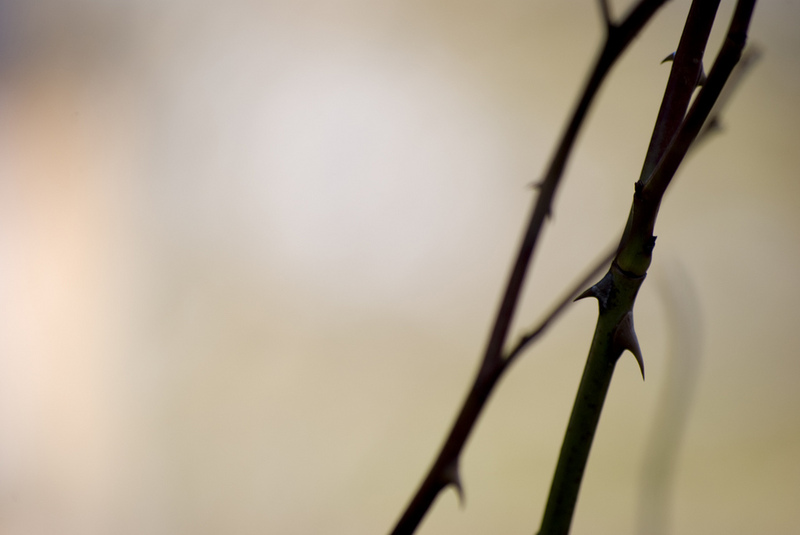 In many variants, the final verses paint a pretty picture of posthumous reconciliation, in which a briar growing from her grave, and a rose from his, entwine themselves over the lovers’ buried corpses. But regardless of whether this coda is included or no, the tonal narrative remains consistent. The universality of Barbara Allen’s moral, and of the emotional core which it takes to reveal it, anticipate the confessional mode of the folk music revival, underscoring its presence as one of the modern folk canon’s most repeated songs. Yet just as our response to dismissal-driven death can range from outrage to sorrow, so do the various versions of this old song cover the emotional gamut. At the extremes, Laura Cortese and Jefferson Hamer‘s saw and rage play well against the sliding melancholy of aging guitarsmith Martin Simpson, while Colin Meloy‘s pinched nasality and full band folk rock turn come in a far tonal cry from the sweet delicacy Lucy Wainright Roche brings to her take. In between, a half-century of versioning offers a breadth of potential as The Waterboys go whispery and sparse, Sunita Staneslow plucks harpstrings under instrumental pipes, The Lilly Brothers and Don Stover play a bluegrass ballad, Shirley Collins floats a nearly medieval take over hollow reeds, Deborah Packard trills thin and sweet over a low drone and haunting flute, Kate Burke and Ruth Hazleton lend Aussie accents and a staggering 5/4 meter to pulsing celtic tones, Jean Ritchie sings a solo appalachian plainsong, Emmylou Harris croons contemporary, and Meg Baird remakes the song as a singer-songwriter’s lament, complete with backporch harmonies and cowboy guitar. Listen singly below, or click to download the entire set for comparison’s sake. Devon Léger, proprietor of Hearth Music, likes a particular kind of organic, neo-traditional folk and roots music, grounded deeply in the past yet sweet and honest enough for modern ears. He’s got great taste, too, and a knack for finding the good stuff. So the fact that the Seattle-based label which Devon runs with his family seems to have added me to their mailing list in recent months has made me happy, indeed. It was Hearth that first made the introduction, via Nell Robinson’s most recent album, which we celebrated in July as a marvel of intimate storytelling peppered with the true grit voices of her family elders. From there, Devon and I got chatting; he recommended Lauren Sheehan’s brand new covers collection Rose City Ramble, which he’s “not promoting at all”, just because he thought I’d share his love for her wonderfully warm, gentle acoustic roots and blues covers, and pointed me to the Hearth Music blog, where he shares news of some pretty impressive roots artists that seem, too often, to be otherwise unsung. From there, I found the Listening Lounge, which features a holy host of retrofolk, bluegrass, and oldtimey artists, a treasure trove of discovery with files galore to sample and save. Devon and co. have also impressed me to no end by picking up on other innovative musicians who I’ve raved about before, but had otherwise lost sight of. Today’s mail, for example, included the debut-as-a-duo album from tradfolk couple Pharis and Jason Romero, which finds the British Colombian folk reconstructionists and banjo-makers (previously touted here for their crystal-clear YouTube work) taking on a mixed set of traditionally sourced and original compositions to powerful effect, one that recalls the best of classic countryfolk guitar-led co-ed pairings from Johnny and June to Welch and Rawlings. The album is being paired with a new work by Romero producer Ivan Rosenberg and The Foggy Hogtown Boys, too, and it’s a great “vinyl-era” tradgrass romp. And among other stellar artists performing in the Next Gen Folk Series which Hearth Music promotes out in Seattle, I find Nic Gareiss and Emma Beaton, a stunningly potent “transcendant traditional folk” duo who I actually did discover, before anyone, when I accidentally wandered into their first ever public performance together way back in the winter of 2009, and subsequently wrote that “if I ever had the time and guts to start producing musicians on my own, I’d start with Emma and Nic”. And so I sing today in praise of the rarest of finds in the busy, increasingly fragmented world of music behind the scenes: a promotional agency that is perfectly genuine and personal; that presents exclusively hand-tooled, authentically crafted music in both live and recorded form; that sees the music they profit from as tied intimately to the music they love, and promotes it all, regardless of who it benefits; that sends physical media banded in brown paper, accompanied by playful yet tastefully classic postcard introductions to the artists, making the music they send a natural extension of the down-to-earth packaging experience, and vice versa. In a world where so much spam fills the blogger’s inbox each day, such genuine thoughtfulness and prescience should not go unrewarded. So here’s some coverage from a few great artists recently touted, promoted, and/or hosted by this tiny yet growing promotion house. 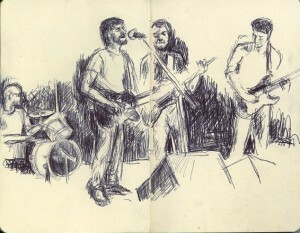 Check ‘em out, and then head over to Hearth Music to buy, book tickets, sample, and blogfollow. Cover Lay Down: on the neverending search for all the greatness in the universe. 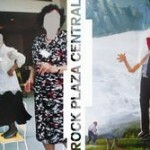 Sharing the best coverfolk we find in it with you since 2007. 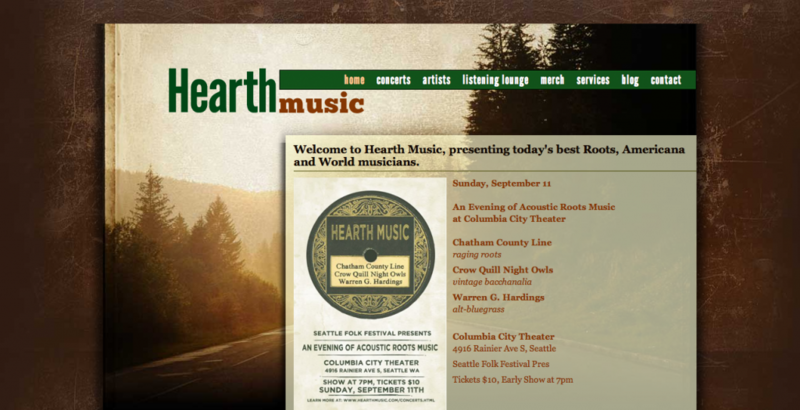 Billboard Adds Folk Charts; Public Radio Drops Folk Programming. …The Nielsen SoundScan-based survey will house new releases from traditional folk artists such Joan Baez, Ani DiFranco and Monsters of Folk, as well as appropriate titles by acoustic-based singer-songwriters such as Carly Simon, Rosanne Cash and Joshua Radin. The 15-position chart, to be managed by Gary Trust, will run periodically in print and appear weekly on billboard.biz and billboard.com. Noble language, that. But even at first glance, Billboard’s inclusion criteria is oddly suspect. Though I happily welcome Radin, Cash, and DiFranco, all of whom we’ve included in our pages recently, I doubt most of us count Carly Simon as folk; similarly, referring to popular indie collaborative Monsters of Folk as “traditional folk artists” seems to indicate a comprehensive disconnect between the modern moniker “folk” and both its historical meaning and its modern sonic norms. Still, the news here seems initially heartening, if a bit late in the game. Billboard deserves some credit for their recognition of the staying power and market measure of the modern folkscene; it may have taken over half a decade for Billboard to acknowledge the genre, but it’s hard to imagine that having these albums off the popcharts and on their own page will not have some positive effects. If nothing else, the change in chart recognition validates folk in ways which – for better or worse – will likely bring greater awareness of the term and those who follow it to a larger audience, and that’s not nothin’. But the mainstreaming of folk comes with its darkside, for sure. Here in New England, even as communities devote themselves to celebration of folk’s past, and even as most folk clubs continue to survive in the midst of a drawn-out recession, local folk radio is slowly dying out. Recent news of programming changes at once-seminal folk and roots vehicle WGBH has drawn severe and justified concern from local folkfans, artists, and promoters. And though we here at CLD think of folk as a much broader tent, WGBH’s recent insistence that “the Boston audience for folk and blues will continue to be served by other stations, particularly WUMB“, has offended folk purists who insist that the AAA format which WUMB adopted in 2007 leaves little room for either older folk artists such as Seeger and Guthrie, or the modern inheritors of such traditional forms. In this light, we might also suggest that Billboard’s move carries a significant risk, in that it changes the tone and tenor of folk marketing to a more commercial-oriented one – or, more accurately, that it confirms already-ongoing changes to the perceived relationship between folk and mass culture, just as the mainstreaming of folk threatens to leave behind the vast majority of what folk is. If so, then our lot must not be despair, but action. Not all action is well-plied, however. In this case, some people have responded to the abovementioned c-change by pushing back against public radio, and while I admire the urge, I cannot condone the approach. 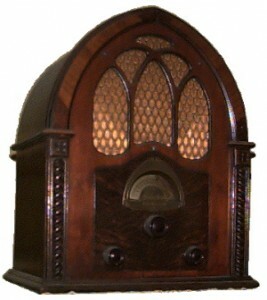 For better or worse, the current financial model of public radio depends on a substantive listenership willing to donate; it is through those donations that public radio learns what its audience desires, and if those running the stations have learned from past fund drives that their listenership is no longer willing to support folk and blues programming, then it’s hard to justify arguing that they should run themselves into the ground to serve a minority. Instead, I maintain that, as the modern fragmentation of microcultures and audiences owes much of its current existence to digital media, so must digital media take up the mantle of resolution. And though local media may not be able to sustain sufficient interest in folk programming to support themselves, if there is enough of a global audience present to support traditional folkforms – and I believe there is – then it is to that global audience that we must turn. Specifically, I believe that blogs such as ours, and the ones we’ve mentioned recently in these pages, must work harder to carry the underground, artist-centric nature of folk forward, through writing, sharing, house concert hosting, and other activities – lest the “Billboardization” of folk transform the conceit of “folk” into a mere marketing designation in the popular mind, thus pushing back against the very power of the folkways, and of the diversity of those artists who quite legitimately claim not just its sales designation, but its history and sentiment. For if the new mainstreaming of folk music which Billboard’s changes represents does not trickle down to all folk artists, regardless of sales power, in the form of renewed interest and attention – and I predict it will not – it becomes even more necessary for us to celebrate those who would target a more honest and human connection than chart sales and mass appeal. Today, then, in honor and anticipation of these changes, and in recognition of the pitfalls and perils which they embody, we present yet another collection of new and recent work from a few less-than-mainstream artists just recently come to our attention. These artists may not be on the top of the charts, and maybe they don’t belong there. But each, in their own way, deserves your attention, too. And in the end, I think you’ll find that their connection to the folk world is undeniable, though they come from all corners of the rich tapestry we call folk. 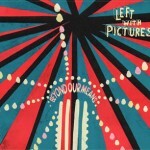 Left With Pictures performs heartwarming folk with a nod to several folkforms; this Richard Thompson cover, for example, combines singer-songwriter guitar, delicate nufolk vocal mannerisms, british folkrock instrumentation, and sea shanty harmonies to great effect. The band calls its work “chamber pop”, and it’s true that it has a touch of the indie sentiment which follows the designation, but I challenge you to call this anything but folk at heart. If you like it, check out the video of them performing the song on the Black Cab Sessions, and then try on their brand new debut Beyond Our Means for more. 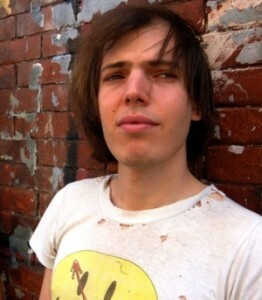 Queerfolk singer-songwriter Lucas Miré contacted me in response to our recent post on Kasey Chambers, offering to share a few more rarities he had gathered; I’m indebted to him for those novelties, which will surely show up in some future (Re)Covered feature, but equally grateful for his inclusion of several of his own covers in the mix, all of which turned out to be wonderful, delicate, richly layered, occasionally dischordant bedroom-folk takes on some surprisingly successful choices from the pop and folkworld. 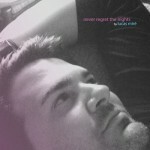 Lucas has recently finished working on his second album, Never Regret The Night, and is offering free streams and full-album downloads for a name-your-price deal over at his bandcamp page; it comes highly recommended, especially for fans of Girlyman, We’re About Nine, and other alternately joyous and poignant folk festival fare. Rock Plaza Central made a splash in the blogworld a few years back with their cover of Justin Timberlake’s Sexyback, which brought bongos, subtle off-beat guitar chords, a flowing fiddle, and their lead singer’s uniquely broken emo whine to the table in style; since then, the Canadian indie band has become a darling of the Daytrotter and Pitchfork set, but despite a Myspace designation as a bluegrass and Americana band, most folkfans would be easily excused for assuming their coverage and delicacy were merely a one-shot reversal. Until now, that is: their recent release of an otherwise extracurricular cover of Dylan’s I Want You reveals a consistent sound with deeper folkroots than previously assumed, perfect for fans of The Decembrists, Clem Snide, or Gandalf Murphy and the Slambovian Circus of Dreams. 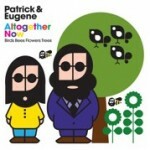 The sounds of vaudeville and the wry humor of filk music feature most prevalent in Altogether Now (Birds Bees Flowers Trees), the U.S. debut release from the UK’s Patrick & Eugene – along with banjos, ukuleles, whistles, and other instruments traditionally found in the world we watch on your behalf. Put it all together in this particular way and it’s barely folk, but the polka rhythms of this cover of Kylie Minogue hit Can’t Get You Out Of My Head speak to a grounding in a diverse set of cultural folkforms, and overwhelm any hint of morning commute marginalia which are so often the inevitable lot of such fun romps through the popworld. I cannot for the life of me remember where I came across “rediscovery artist” David Potts-Dupre, who in his fifties has rejuvenated his career the hard way, coming up through the ranks of political gatherings and coffeehouse folk via Maryland-based musical collaborative TakomaZone. 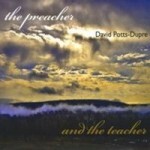 The countrygrass/ Americana Wilco cover which dropped as if from the sky comes from last year’s The Preacher and the Teacher, which represents the culmination of that journey. Like many of the originals and other covers on that substantive album, it reveals a troubadors sentiment and a tradfolker’s heart, and though a few of the tracks on the album are a bit earnest for my taste, despite both song and its performer’s advanced age, it deserves to be shared and celebrated. We’re proud to do our part to keep the folkworld honest, broad, and rich by continuing to present and support a diverse set of artists, old and new, who claim the folk designation as their own. And we plan on doing so every Wednesday and Sunday for as long as we have strength to carry on. But if you believe, as I do, that all branches of folk are worth preserving, then I call on you to do your part, too. DONATE to blogs which you feel serve the broader definition of folk, book tickets for summer festivals in advance, make it a point to support local folk venues, coffeehouses, and house concerts in your area – in Massachusetts, that would include such spaces as Passim and the Lizard Lounge in Cambridge, the Iron Horse in Northampton, and the Notlob concert series in the Greater Boston area – and, most importantly, consider purchasing the works of those listed proudly in these pages and others. Tell ‘em boyhowdy sent you. Since we started Cover Lay Down a few months ago, I’ve struggled a bit with the regular inclusion of indiefolk in the mix. After all, if nothing else, the cultural disconnect between audiences is stark: with a few exceptions on the fringe of everything — see, for example, The Abigail Washburn Quartet, who I have seen at Grey Fox Bluegrass Festival, but others more hardy than myself have seen at Bonnaroo — you’ll not find Sam Amidon or Fleet Foxes at a true-blue “folk” festival anymore than you’re likely to catch John Gorka or Chris Pureka at one of those hipster festivals that, frankly, I’m just too old to attend without hurting myself. But though the audiences may remain relatively disparate, the sonic commonality between oldfolk and the newest generation of folk music cannot be denied. One of the things I love about local music festivals such as the Boston Celtic Music Festival, for example, is the sudden realization that the musicians I’m watching are really doing something very much like what the Avett Brothers are doing, except the Avett Brothers are on all the cool blogs, and here I am surrounded by old people listening to young people. Which is to say: I’m not the only folkblogger, and I’m certainly not the most popular or savvy one. But I believe I am the only one to have featured both Emma Beaton and Mersault in one entry. And maybe it’s time to say something about that. The whole thing is worth celebrating, of course, even in potential. The treatment of any form of folk as cool and underground and hip is a relatively new phenomenon, driven, among many other factors, by both bloggers’ and musicians’ desire to find the authentic in a world of digital distance. There was no buzz around Sam Amidon when we started this blog, and Song, By Toad was just another pubwatcher, not a trendsetter like today; since then, though surely it was not so sudden after all, it feels like the world has gotten that much smaller and more intimate, and something very much like traditional folk has suddenly become a part of the normative spectrum for young kids. But don’t just take my word for it. A number of new and noteworthy projects and products demonstrate the way this trend towards full collapse of indie into folk is accelerating. You’ll see it in full bloom at SXSW this year, for example, though that festival has always been a hotbed of folk/indie hybridism. But whether you’re an old hand at the indie scene or just an old folkie who’s been wondering if your rapidly aging festival coordinators are still in touch with the ways that folk is evolving, here’s some work to watch. First and foremost, and as far as I can tell not yet otherwise on the blogosphere radar, tomorrow marks the drop date for The Old Lonesome Sound, a totally free compilation of traditional folk songs done by the newest crop of indiefolk artists and blog darlings. Songs include old standards from House Carpenter to Moonshiner to I Ain’t Got No Home, plus many other trad tunes less well known to all but the oldest folkies. (In fact, given the abovementioned disconnect between old folks and new, it’s tempting to say that half of my readers will recognize the songs, while the other half will recognize the artists.) But if the two songs released as teasers are any indication, we’re looking at some raw and delicate turns on familiar folksong which honors the source while managing to reinforce the particularly echo-y, lo-fi intimacy which characterizes the indiefolk subgenre. This just might be the moment that indiefolk claims its rightful place in the folk pantheon, thereby justifying our attention to the movement over the past year in and among the tradfolk and contemporary folkpop. Kudos to Splice Today, an increasingly cutting-edge upstart who is putting the tradfolk compilation forward, and who gets major bonus points for having the balls to frame the project as a “first annual”. Whether it makes it another year or not, with names like These United States, Deer Tick, and Vandaveer onboard, this one’s going to be all over the blogs by next week. Listen below, and say you heard it here first. Second, on a slightly smaller but no less anecdotally relevant scale: recent blogmention of several individual songs and projects have brought me a growing set of one-shot tradfolk covers from indiefolk that deserve to be pushed across the traditional dividing line between old folk and indie, in the hopes that the line will be scuffed up beyond recognition along the way. Again, note the ringing, almost hollow sound of these covers, with their echo-chamber vocals and half-buried loosely-tuned string arrangement; though the production, and the raw emotion behind them, have come to define a subgenre, they also make this music both folk, and perfectly akin to what might get performed at a late-night folk festival set, though the crowds and booking agents have yet to figure out how to truly unite the audiences involved. 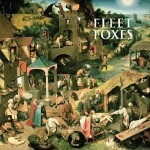 There’s a lot of possibles here, so I’ve picked but a few examples; a quick perusal of our own backposts will show that I’ve been sneaking this stuff in for a while now, so in one way, this is nothing but an excuse to post a few great indiefolk songs I’ve had kicking around waiting for a mandate or framing device to justify them. But if nothing else, make sure you start with the first cover before you go: whether you recognized the name of new chart-climbers Fleet Foxes or not when I mentioned them above, you’ll surely love this take on an ancient britfolk ballad from lead singer Robin Pecknold’s side project, White Antelope, found via Pitchfork, that self-professed bleeding-edge leader of all things indie. As always here on Cover Lay Down, the purpose of our promotion is perpetuation: if you like what you hear, follow links above to artist- and label-sponsored links for purchase and free download. And, given today’s discussion, if you or someone you know has the power to bring old and new audiences together, whether that’s though booking artists, filling stages at festivals, or getting new music into older ears through radioplay and Starbucks cover compilations, step up, speak up, and change the world. It’s the folk way, no matter what kind of folk you are. Cover Lay Down posts new coverfolk features Wednesdays, Sundays, and the occasional otherday. Coming soon: covers of, covers from, and yet another installment in our ever-popular Single Song Sunday series. Plus: coffeehouse singer-songwriter Susan Werner goes chamberfolk on her newest release, and we love every cello-laden minute of it. Elizabeth Cotten and Arthel “Doc” Watson share more than just a connection to the state of North Carolina. Both were culturally disadvantaged — Cotten due to her skin color, and Doc due to a lifelong blindness. Each started performing in childhood, but became truly famous in the great folk revival of the sixties. Both are known for songs which celebrate the hard life and trials of their beloved rural south while addressing universal themes of loss, change, and heartache. And, most importantly, though no one could confuse Cotten’s rural bluesfolk for Doc’s country swing style, each is ranked among the best acoustic fingerpickers of their generation. But the differences between the two are great, as well. In fact, presenting Doc Watson and Elizabeth Cotten side by side makes for an interesting exercise in folk history, one which allows us to see the great diversity of the strands and influences which came together to make modern folk music in America. 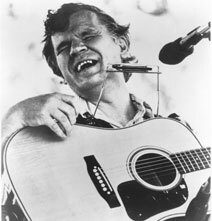 Unlike Elizabeth Cotton, who came back to folk in the sixties after a long hiatus, Doc Watson (b. 1923) was always a musician, busking with his brother for pennies as a child, supporting himself and his family with his work as a piano tuner to pay the bills when he could not find paid work as a sideman. Though he worked through much of the fifties as an electric guitar player with a country and western swing band, when the modern folk scene began to crystalize in the early sixties, Doc switched over to acoustic guitar and banjo exclusively, making a name for himself as one of the best fingerpickers in the business, and finding himself in high demand on the burgeoning folk circuit. Where Cotten is primarily known for her original songs and original rhythmic style, Doc Watson’s greatest contributions to folk music came from his source material and lightning speed. His ability to blow the socks off every other picker in the room is well known, and his work as a songwriter is honest and respectable. But as folk, his repertoire is most significant for its use of songs from the oral tradition which might otherwise have been lost. 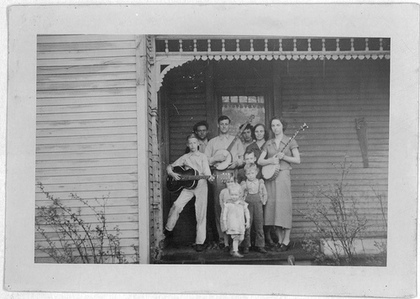 We might say that while it was Mike Seeger’s recordings of Elizabeth Cotten which saved her authentic voice, Doc Watson’s recordings and performance of the mountain ballads from the areas around his home of Deep Gap, North Carolina allow us to consider Doc a Seeger to his own people. This is not to say that the tradsongs of Doc Watson sound anything like Cotten’s originals, stylistically-speaking. While Cotten’s fingerpicking style comes from applying banjo style to the guitar, Watson’s quickfingered picking style is the successful result of moving songs that were traditionally fiddle tunes to the acoustic guitar. Where Cotton was self-taught, Watson learned his trade through the traditional country songs of the south, and the songs of early country greats like the Louvin and Monroe Brothers. Where Cotton ended up finding a style that sounded more like early blues musicians, Watson’s different approach and experience, plus his apprenticeship in the country and western genres, left him with a wail and a sense of rhythm that call to the same acoustic old-timey country sound that you might hear in the rougher, hippier corners of bluegrass and country festivals today. Another way of saying this might be to point out that where Cotten shows the blues influence on folk music, Doc Watson shows the country — an influence which, despite its significance, is often the elephant in the room when it comes to folk music. His style and his “mountain music” sound hark to a time back before country and folk music had truly split off from each other, and long before alt-country bands like Uncle Tupelo, newgrass bands like Yonder Mountain String Band, old timey bands like Old Crow Medicine Show, and modern western swing folk musicians like Eilen Jewell went spelunking in the deep well of potential that lies between true country music and the post-sixties folk (and rock) music scenes. Today, both country and folk music claim Doc Watson as one of their own, and rightfully so. Doc holds multiple Grammy awards in both the Traditional Folk and the Country Instrumental categories; Merlefest — the festival named after Doc’s son and long-time musical partner, who died in a tractor accident in 1985 — is known for attracting the best music and musicians from the intersection of folk, bluegrass, and country. 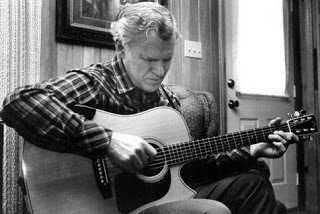 But no matter what you call it, Doc Watson’s sound is instantly recognizable, powerful, and no less potent today, eighty years after it could be heard on the streets of his beloved North Carolina. Today’s collection is a bit heavier on the tradfolk than cover lovers might ordinarily prefer. But this is no loss. Focusing primarily on the traditional folksongs Watson interpreted allows us to celebrate one of his greatest contributions to American folk music. Though the pickin’s are slim, thanks to some of the great bloggers that have come before me and the luck of a grab-and-go draw before we hit the road last Friday, what follows includes some great and representative tradfolk from a fifty year career, from old live recordings with Merle to Doc’s haunting baritone lead vocals on a beautiful back-porch version of Gershwin’s faux spiritual Summertime. I’m no expert on the works of Doc Watson, and as you can see from the diverse source albums listed above, his catalog is especially prolific. But if you’re new to his sound, and want to begin a collection, purists tell me the best place to start is Smithsonian Folkways for the older stuff, and Doc Watson and David Holt’s page for his most recent Grammy-winning work. Also recommended, since we missed Record Store Day last Saturday: head to your local record store and, after searching fruitlessly for sections labeled “Traditional Folk” or “Traditional Country”, ask for any of the above-mentioned disks by name. Cover Lay Down will be heading from North Carolina to Massachusetts on Saturday, and will return Sunday evening with a feature on an artist who made the same transition. Keep pickin’ and grinnin’, and we’ll see you then.